Horse racing tends to conjure images of fancy days out at the races, where everyone has the chance to get a little dressed up. There is a certain prestige and elegance surrounding this sport that attracts people from all walks of life. Yet the reality for the racehorses who are pushed to their limits and often have their lives put at risk is quite different. The Grand National is one such horse race that attracts both thousands of spectators and ample criticism. 2019′s event saw the death of three horses — most notably Up For Review, who landed on his neck after jumping the first 30-foot fence and died, convulsing on live TV, the Independent reports. Viewers were horrified to watch this poor horse’s final moments. And #Youbettheydie immediately began trending on Twitter, with many vowing to boycott all future Grand Nationals for its cruelty. Despite the public response, the British Horseracing Authority decided not to conduct a review of the event. “It is obviously sad when we lose any horse, but it is important to note that the Grand National Festival, and the big race itself, have a very strong recent record since the measured changes implemented by the course and the BHA following the review in 2011,” British Horseracing Authority Chief Executive Nick Rust told Sky Sports News. And this wasn’t the only recent example of the British Horseracing Authority’s inaction as horses suffered. In March 2019, the Cheltenham Festival faced criticism when four horses fell and needed emergency veterinary attention. Thankfully three recovered within minutes, but a horse named Ballyward had to be euthanized on the spot. Three jockeys were suspended for animal cruelty for continuing to race “when it appeared to be contrary to the horse’s welfare,” according to The Guardian. Again, the British Horseracing Authority’s review panel failed to see the need for changes — noting only that falls were on a decline. This feels very much like the value of human entertainment is placed far higher than the safety of these horses. 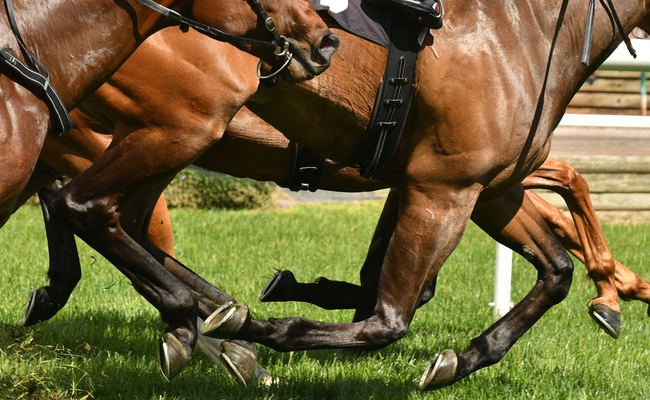 Animal Aid found almost 40 percent of racehorse fatalities were due to broken bones, fatal spinal injuries, heart attacks or burst blood vessels. And according to the League Against Cruel Sports, British Horseracing Authority data showed that between 2010 and 2015 an average 193 horses per year died due to racing. But this figure doesn’t even include horse deaths from incidents during training or elective euthanasia following a race or training-related injury. It is astonishing that this could be seen as an acceptable figure from an equestrian organization purporting to care for horses. Perhaps even more horrific is the way horses are bred to go into this fatal industry. According to Animal Aid, a stallion might be expected to cover three mares a day over the six-month breeding period — while living a life almost in total isolation when not breeding to minimize risk of injury. Mares in the wild might have one foal every two years, but those bred for racehorses are pregnant every year. A horse pregnancy is 11 months. This is a barbaric way to treat a horse purely for future profit. Horse racing attracts a glamorous crowd who might be oblivious to the cruelty of the sport. Please consider learning more about the treatment of racehorses, and boycott these barbaric races that put the lives of horses at risk purely for our entertainment.